Last week was Pi Day (March 14th, or 3/14), a day fully created to make my math tutor/chef’s heart skip a beat. I love the number-to-date relationship (not to bring back nightmares from Geometry, but pi (∏), an irrational number representing the ratio between the circumference and diameter of a circle, is 3.14159…). I, of course, also love pie (remember my ode to pie from last year, Easy as Pi (Day)? For this year’s Pi Day I made a single crust Chicken Pot Pie (I had a cooked chicken breast I wanted to use up…easy peasy. 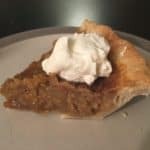 Dessert, though, that was a bit more challenging…I wanted Butterscotch Pie from Smitten Kitchen, but since I was only cooking for my husband and myself, I wanted a mini 6-inch pie that wouldn’t call to me from the fridge for the rest of the week. The pie crust recipe, like most pie recipes, was designed for 9-inch pie pans that serve 8. Hmmm…there was only one way forward for me: MATH! My Pi Day entrée…Chicken Pot Pie. All those divots you see in the crust? That’s where the frozen fat didn’t properly incorporate into the flour (my bad). It was still yummy! I see you cringing in your seat…don’t worry! I only needed to calculate the volume of a 6-inch pie pan and the volume of a 9-inch pie pan, then divide the two answers and adjust each ingredients weight by the result (Ummm…pie pans are sloped). An internet search came up empty — I found various answers for the volume of 9-inch pie pan but none for the 6-inch pie pan. Ok, new plan…I just filled each pan with water and poured that amount into a measuring cup. The result? A 9-inch pan held 4 cups and a 6-inch pan held 1-1/2 cups, so the ratio to adjust the ingredients was 3/8. In the end I just divided the recipe in half and had done with it! For making a pie dough, place the wrapped package directly in the freezer (if you don’t have half to a full day to chill it in the fridge) for about 20 minutes until firm, but please keep an eye on it (we don’t want it fully frozen). Then roll it out, freeze it right on the pie plate and use foil to hold the shape instead of pie weighs. While the crust is par-baking, make the filling and pour it in right when the crust comes out of the oven. By hand: In the bottom of a large bowl, combine the flour, salt and sugar. Work the butter into the flour with your fingertips or a pastry blender until mixture resembles a coarse meal and the largest bits of butter are the size of tiny peas. Add 1/4 cup cold water and 1 tsp vinegar and stir with a spoon or flexible silicone spatula until large clumps form. Use your hands to knead the dough together, right in the bottom of the bowl. If necessary to bring the dough together, you can add another tablespoon of water. With a food processor: In the work bowl of a food processor, combine flour, salt and sugar. Add butter and pulse machine until mixture resembles a coarse meal and the largest bits of butter are the size of tiny peas. Turn mixture out into mixing bowl. Add 1/4 cup cold water and 1 tsp vinegar and stir with a spoon or flexible silicone spatula until large clumps form. Use your hands to knead the dough together, right in the bottom of the bowl. If necessary to bring the dough together, you can add the last tablespoon of water. Both methods: Wrap dough in a sheet of plastic wrap and refrigerate for at least one hour, or up to 48 hours, or you can quick-firm this in the freezer for 15 to 20 minutes. Longer than 2 days, it’s best to freeze it until needed. On a floured counter, roll the dough out into a 7- to 8-inch circle-ish shape. Drape dough around rolling pin and transfer to a 6-inch pie pan. Trim overhang to about 1/2-inch. Fold overhang under edge of pie crust and crimp decoratively. Save scraps in fridge, just in case. Freeze crust for 15 minutes, until solid. Dock all over with a fork. Coat a piece of foil with butter or nonstick spray and press tightly against frozen pie shell, covering the dough and rim and molding it to fit the shape of the edges. Bake for 20 minutes, then carefully, gently remove foil. If any parts have puffed, just press them gently back into place. Patch any tears or cracks with reserved dough scraps. Leave oven on. Melt butter in a medium heavy-bottomed saucepan over medium heat. Add the sugar and salt and stir to combine (it will be clumpy, not smooth) then let simmer for 2 to 3 minutes, stirring. Whisk in cream and remove from heat. Let mixture cool for 15 minutes, then whisk in eggs, one at a time, and the vanilla. As soon as crust comes out of oven, you can pour in the filling. Bake for 10 minutes at 400°F, and then reduce heat to 300°F (150°C) and bake pie another 20 to 25 minutes. A fully baked pie will only jiggle slightly in center when moved. Let cool completely and serve chilled or at room temperature in wedges with softly whipped unsweetened or lightly sweetened whipped cream. The filling smoothes out as you cook it, and I had the right about of filling for the shell. Yay! Tastes delicious, but what’s with the divot? This Butterscotch Pie was rather ugly coming out of the oven (what’s with that divot in the middle? ), but it was quite delicious…it had the consistency of pecan pie filling with a lovely butterscotch flavor from the salt and vanilla (and no one noticed the divot when it was sliced & served). I almost wish I had made the full recipe just so it would call out to me. Anyway, I consider this year’s Pi Day well celebrated, with pie and math! p.s. We lost Dr. Stephan Hawking, that eminent astrophysicist, on Pi Day last week. Hobbled in body, Dr. Hawking’s mind soared in the universe using math as his spaceship. I think Pi Day is a fitting day to celebrate his life, don’t you?